Categorization, the basic cognitive process of arranging objects into categories, is a fundamental process in human and machine intelligence and is central to investigations and research in cognitive science. Until now, categorization has been approached from singular disciplinary perspectives with little overlap or communication between the disciplines involved (Linguistics, Psychology, Philosophy, Neuroscience, Computer Science, Cognitive Anthropology). Henri Cohen and Claire Lefebvre have gathered together a stellar collection of contributors in this unique, ambitious attempt to bring together converging disciplinary and conceptual perspectives on this topic. "Categorization is a key concept across the range of cognitive sciences, including linguistics and philosophy, yet hitherto it has been hard to find accounts that go beyond the concerns of one or two individual disciplines. 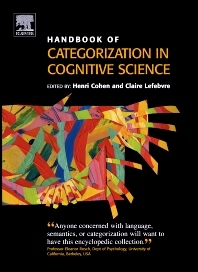 The Handbook of Categorization in Cognitive Science provides just the sort of interdisciplinary approach that is necessary to synthesize knowledge from the different fields and provide the basis for future innovation." "Anyone concerned with language, semantics, or categorization will want to have this encyclopedic collection." Researchers and graduate students, scientists and practitioners. Bridging the Category Divide. (H. Cohen, C. Lefebvre). Part 1 : Categorization in Cognitive Science. To Cognize is to Categorize: Cognition is Categorization. (S. Harnad). A Modular Approach to Grammatical Categories. (P. Muysken). Empty Concepts and Philosophical Analysis. (G. Rey). Categories and Cognitive Anthropology. (J. Boster). Categorization in Neuroscience: Brain Response to Objects and Events. (S.J. Hanson, C. Hanson). Categorization in Cognitive Computer Science. (J.F. Sowa). Part 2 : Semantic Categories. Semantic Categorization. (B. Gillon). Emotion Categories Across Languages. (J. Boster). The World Color Survey Database. (R. Cook, P. Kay, T. Regier). Atoms, Categorization and Conceptual Change. (P. Thagard, E. Toombs). Relation between Language and Though: Individuation and the Count/Mass Distinction. (A. Papafragou). Definitions in Categorization and Similarity Judgements. (S. Larochelle, D. Cousineau, A. Archambault). Why (Most) Concepts Aren't Categories? (R. Millikan). Part 3 : Syntactic Categories. Lexical, Functional, Crossover and Multifunctional Categories. (L. Travis). Isolating-Monocategorial-Associational Language. (D. Gil). Categories in Quebec Sign Language: Reflection on Categorization Across Modalities. (D. Bouchard, C. Dubuisson, Anne-Marie Parisot). Syntactic Categories in Signed versus Spoken Languages. (D. Lillo-Martin). On Syntactic Categories. (M. Baker). Part 4 : Acquisition of Categories. The Acquisition of Grammatical Categories: The State of the Art. (M. Labelle). Semantic Categories in Acquisition. (E. Clark). Early Syntactic Categories in Infants' Language. (R. Shi). Acquiring Auditory and Phonetic Categories. (M. Goudbeek et al.). Syntactic Categories in Second Language Acquisition. (L. White). The Development of Categories in Linguistic and Nonlinguistic Domains. (D. Poulin-Dubois). Part 5 : Neuroscience of Categorization and Category Learning. The Theory of Perceptual Category Learning. (F.G. Ashby, V.V. Valentin). The Neuropsychology of Perceptual Category Learning. (W.T. Maddox, J. Vincent Filoteo). Neural Regions Associated with Categorical Speech Perception and Production. (S. Ravizza). Part 6 : Categories in Perception and Inference. Situated Conceptualization. (L. Barsalou). Perceptual and Semantic Reorganization During Category Learning. (R. Goldstone et al.). The Return of Concept Empiricism. (J. Prinz). Part 7 : Grounding, Recognition, and Reasoning in Categorization. Categorization, Reasoning, and Memory. (S. Robert). Approaches to Grounding Symbols in Perceptual and Sensorimotor Categories. (A. Cangelosi). Embodied Categorization. (P. Poirier, B. Hardy-Vallée, J-F. De Pasquale). Categorization of Objects, Scenes, and Faces through Time. (É. McCabe, C. Blais, F. Gosselin). Adaptive Categorization in Neural Networks. (R. Proulx, S. Hélie). A Grounded Mind in a Robotic Body. (S. Harnad). Part 8 : Machine Category Learning. Concept Learning and Nonmonotonic Reasoning. (P. Gärdenfors). Categorization in Symbolic Data Analysis. (E. Diday). Category Formation in Self-Organizing Embodied Agents. (S. Nolfi). An Information-based Discussion of Vagueness. (D. Dubois et al.). Part 9: Data Mining for Categories and Ontologies. An Introduction to Symbol Methods for Knowledge Discovery. (A. Napoli). Genre-Specific Text Mining and Extensional Inductive Concept Recognition. (Y. Kodratoff). Classification and Categorization in Computer-Assisted Reading and Text Analysis. (J-G. Meunier, D. Forest, I. Biskri). Graph Matching, System Design and Knowledge Modeling. (G. Mineau). Part 10 : The Naturalization of Categories. Nominalism and the Theory of Concepts. (C. Panaccio). Why Do We Think Racially? (E. Machery, L. Faucher). Neurosemantics and Categories. (C. Eliasmith). Conceptual Analysis and Philosophical Naturalism. (E. Lalumera). Crisis! What crisis? (P. Poirier). Dr. Henri Cohen’s research interests focus on speech and language development and neurological disorders, learning and emotion in Parkinson’s disease, complexity and learning, skill acquisition and interference, and origin of language. He is Professor of Psychology (ret.) at Université du Québec à Montréal, and visiting scholar, at Pontificia Universidad Católica de Chile, Universidad de la Frontera, Chile. He has published over 100 peer-reviewed articles, and edited two books (with Elsevier) on cognition and consciousness, and on categorization, and a book on the origins of language (Benjamins). He is the current editor of Brain and Cognition (Elsevier), and past editor of Journal of Neurolinguistics (Elsevier). Department of Linguistics, University of Quebec, Montreal, Canada. Dr. Lefebvre studies: linguistic theory, syntactic category theory; cognitive processes involved in the formation of new languages; languages in contact, French, Quechua, Creole Haitian, Fon, and other African languages.